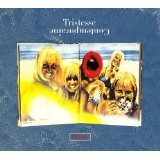 Tristesse Comtemporaine is a collaboration between former singer of Earthling, Maik, former Japanese punk singer, Marumi and Swedish guitarist Leo (a former hockey player) and “Stay Golden” is their second album. After hearing the album’s opening track a few months ago, I was interested enough to want to hear the rest of the album; intrigued, even. Perhaps I should have just left it at that. Once you get past the opening tracks, “Fire”, “Stay Golden” and “Waiting”, everything starts to sound very familiar. There’s a template which is applied to almost every track; the opening is minimalist percussion or synth sounds, a breathy vocal comes in and then layers are added as the song progresses. Where this works it works really well, but would you want to have the same food every time you eat? Some of the elements are interesting; there are some nice synth sounds and the occasional blast of crunching guitar. The vocals are generally breathy and close-miked, sounding like something midway between Chris Difford (Squeeze) and The Beloved’s Jon Marsh, and they initially pull the listener in, like an orator lowering their voice for emphasis but the impact is lost when the technique is used constantly. There’s a lot of repetition on the album (drum patterns, looped synth lines and repeated lyrics) which gives the impression that Tristesse Contemporaine didn’t have enough original ideas for a whole album. There are moments when the trio achieve what I think they set out to achieve and create moods that are languorous, menacing and disturbing both musically and lyrically. When this happens, it’s very powerful and evocative, but the problem for me is that it doesn’t happen often enough. The alienation evoked by the songs is emphasised in the videos but, ultimately, the project feels like an attempt to seem interesting by being self-consciously strange. It might work for you but it doesn’t really do it for me. There some very interesting (and disturbing) ideas here musically and lyrically, but they are spread very thinly. Tristesse Contemporaine could have released a very good four or five track EP from this selection, but in this format, it’s a frustrating hint at what could have been a very good album. Out now on Record Makers (REC 100-01-LC-16765).